The initial question is whether White Fang can properly be described as a western, since it also seems to belong to other genres: adventure stories, man vs. nature stories, animal stories, coming-of-age stories, search-for-family stories. But all of those have shown up as westerns, too. The settings (Alaska and the Klondike during the gold rush of 1898) are a little unusual. But they are situated in the North American west and have previously been the settings for obvious westerns: Anthony Mann’s The Far Country, for example, North to Alaska and various versions of Rex Beach’s novel The Spoilers. The source novel by Jack London is more firmly in the animal story category, but this has a lot of western feel about it. 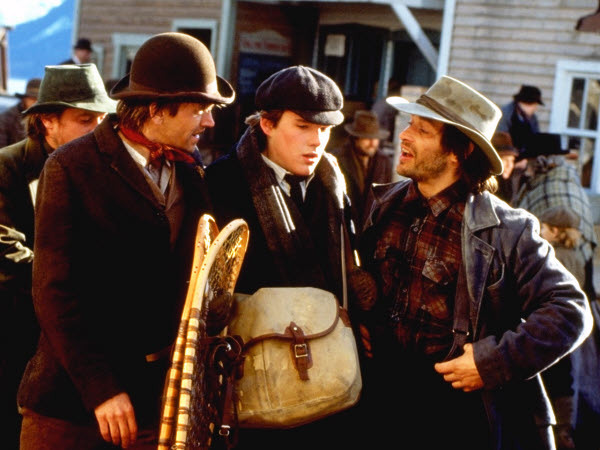 In 1898, young orphan Jack Conroy (Ethan Hawke at 21 but looking and playing younger) arrives in Skagway from San Francisco, at the height of the gold rush in the swirl and noise of the booming port. He is immediately robbed by Beauty Smith (James Remar) and his two compatriots while looking for Alex Larson, an acquaintance of his late father’s. 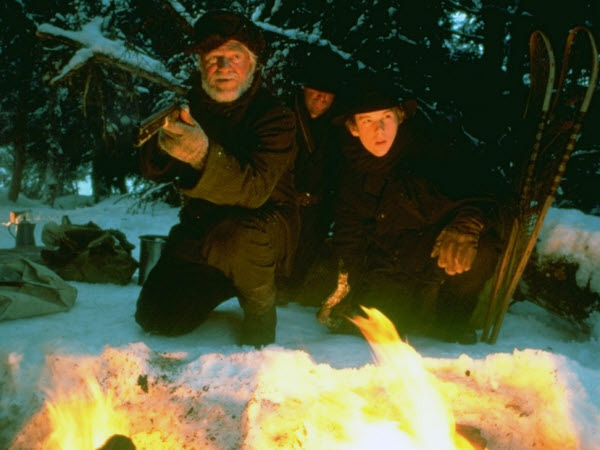 Larson (the redoubtable Klaus Maria Brandauer) is heading over Chilkoot Pass for the diggings in the Klondike with his partner Skunker (Seymour Cassel) and doesn’t want to take on another person. One reason: his load includes the coffin of Dutch, whom he had promised to bury on his claim. That adds a macabre note to the journey, in addition to being very unwieldy. Jack manages to convince Alex and Skunker to let him tag along with their dog team, although Alex thinks he’s bringing too many useless items, like books. On the trip, Jack learns a lot, partially by getting Dutch’s body dumped into a freezing lake and losing most of their ammunition. 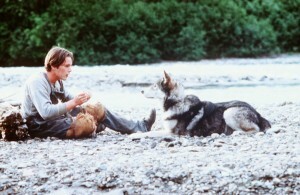 One night the camp is attacked by wolves and Skunker is killed by the pack. Jack spots a very young whitish wolf, who won’t let him get close. As Alex and Jack arrive in Dawson City, Alex renews his relationship with Belinda Casey (Susan Hogan), who owns a bar there. 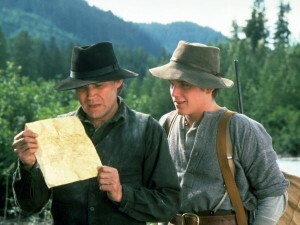 He takes Jack out to his father’s claim and agrees to teach Jack to be a miner if Jack will teach him to read. Meanwhile, the young white wolf is captured by the local Indian tribe, led by Gray Beaver (Pius Savage), who train it as a beast of burden. On a trip up the river, Jack encounters and remembers the dog. Gray Beaver says his name is Mia Tuk, or White Fang. When Jack disturbs a grizzly bear and is attacked, Fang saves him by discouraging the bear. On a trip to Dawson, Beauty Smith cons Gray Beaver out of the wolf-dog, whom he plans to make into a fighter. He does this by unsavory methods, and the wolf-dog learns well until he meets a pit bull-type. As Fang lies in the ring with the pit bull’s jaws claimped on his neck, the mounties break up the fight and Jack takes possession of the desperately injured Fang. Jack and Alex get him back to Jack’s claim, where Jack nurses him slowly back to health and tries to form a relationship of sorts. When Jack is buried in a cave-in, Fang digs him out and Alex finds Fang’s paws covered with shiny dust. Gold! Beauty Smith has already established that he has no qualms about robbery, stealing and dog-fighting. He proceeds to establish that he is not beyond killing and claim-jumping, either, when he and his two henchmen attack Jack and Alex and set their cabin on fire. Fang turns the tide when he jumps through a window and attacks the attackers, allowing Jack and Alex to capture them and turn them over to the mounties. Jack has given half the title to the claim to Alex, and Alex plans to move to San Francisco with Belinda to open a hotel there. They invite Jack along, but in the end he stays on the claim with Fang, since Fang can’t really be as civilized as San Francisco would demand. Ethan Hawke is a good actor, and he was very good in this early role. The real center of the movie, however, is Klaus Maria Brandauer as Alex. Theoretically, Alex Larson is a supporting role—the capable miner and wilderness man who tutors the city boy. But he is such a good actor that he provides a solid and interesting center for the film in this supporting role. In the end, this movie is about relationships—not just the relationship that develops between Jack and Fang, but just as much about the relationship developing between Alex and Jack. Both are about learning to trust. Seymour Cassel is good as Skunker in a very limited role, and James Remar is suitably despicable as Beauty Smith. The movie is made by Disney, and that usually is not a great sign. But this partakes of Disney’s legacy of nature movies and dog stories (e.g., Old Yeller) in a good way. There is a little more violence than is usual in Disney movies, but nothing very graphic. It is well-paced, although significantly more than half the movie passes before Jack and Fang get together. Although the film has a decent screenplay, much of the story is told visually, without dialogue. It’s an effective approach here. This film partakes heavily of the romantic cinematic view of wolves, as in Dances With Wolves and Never Cry Wolf. It’s a tradition it shares with Rudyard Kipling’s The Jungle Books. A note at the end of a movie says there’s no documented instance of wolves killing a human, as happened with Skunker in this movie. They still tend to be pretty scary, especially in packs. The movie was filmed on location in Alaska, around Haines and Skagway. There is panoramic scenery elegantly filmed by cinematographer Tony Pierce-Roberts, and a panoramic score by Basil Poledouris, according to the credits. Actually, Basil Poledouris was hired to write the film’s original score, having worked with director Kleiser on The Blue Lagoon. Poledouris’ score was rejected in mid-production in favor of one from Hans Zimmer. Unusually, both scores were fully recorded, one in London and the other in California, and pieces written by both Poledouris and Zimmer appear in the finished film. Director Randal Kleiser is a sort of journeyman commercial-movie director, known principally for Grease and The Blue Lagoon. One wouldn’t have looked for something as good, as visual and as modest as this from him. It was successful enough that a sequel was made three years later, with none of the participants from this first film. This entry was posted in Westerns Worth Watching and tagged Northern Westerns on October 31, 2013 by Nicholas Chennault. “Adult Entertainment” in the sense that it deals with violence by both sides. Burt Lancaster’s last significant western (he later appeared in supporting roles as Ned Buntline in Buffalo Bill and the Indians and as Bill Doolin in Cattle Annie and Little Britches), and one of the last good cavalry movies. Lancaster’s Archie McIntosh the old scout has a certain amount in common with Bob Valdez from Valdez Is Coming the previous year, but in this one he is still scouting and is more tired. This is also a “teaching the young lieutenant” movie. The young lieutenant is Lt. Garnett DeBuin (well-played by Bruce Davison), recent West Point graduate and son of a Philadelphia minister. He is sent out from his fort in Arizona with a patrol in pursuit when Chiricahua Apache leader Ulzana jumps the White Mountain Reservation with several braves. Going along as advisers and guides are old scout McIntosh and Apache Ke-Ni-Tay, Ulzana’s brother-in-law (Jorge Luke, also excellent). These three central characters (the old scout, the Indian scout with questionable loyalties and the young lieutenant) could be clichés, but they’re all well-played here. The old scout (Lancaster) and the young lieutenant (Davison). The lieutenant learns, but it has its costs. He has a hard time reconciling brutal Apache behavior with what he understands of the Bible, and also has to learn to judge men older and more experienced than he. Initially Ulzana has the upper hand, raiding a couple of ranches ahead of the troopers. But McIntosh succeeds in killing Ulzana’s horses during the execution of an Apache stratagem, also killing Ulzana’s young son in the process. To draw the Apaches out of rough country, McIntosh and DeBuin set up their own stratagem, using a wagon, a small patrol, a deranged woman and McIntosh as bait for Ulzana. It works, but again at a cost. The last shot is a stop motion of the dying McIntosh, like the end of Butch Cassidy and the Sundance Kid, so we don’t actually see his death although we understand that it’s inevitable. 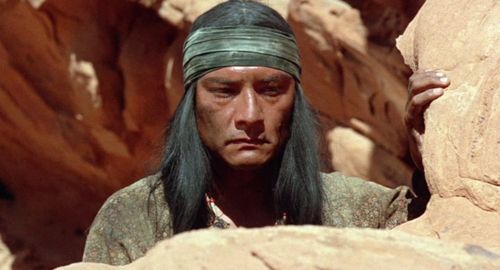 Ke-Ni-Tay gets Ulzana (Joaquin Martinez, with no lines in English and few in Apache) but allows him a certain amount of dignity, in the end establishing his loyalty as a scout. A downer of an ending to a good western, like Hombre. And DeBuin learns and will likely be a better officer than most. Not a powerhouse cast at a time when westerns, and particularly cavalry westerns, were fading from public consciousness; this had a small budget and short shooting schedule. It depends on the performances of Lancaster and Davison, in particular. We know that Lancaster is good, but so is the young Davison. 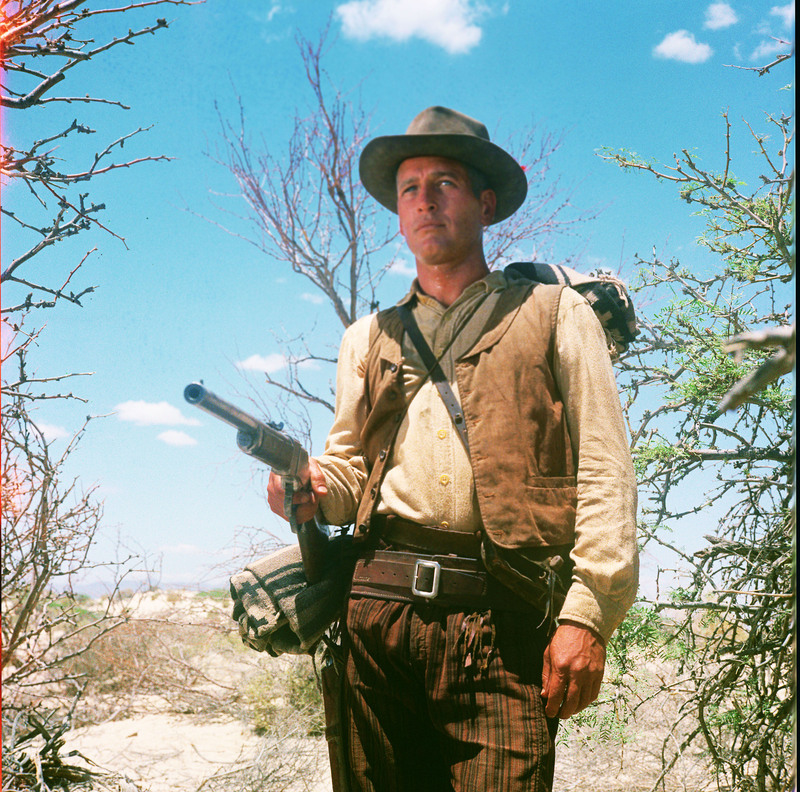 Richard Jaeckel is the quintessential sergeant (as in The Dirty Dozen), and he does not survive Ulzana’s final ambush, either. Richard Farnsworth, longtime stuntman and still a decade away from meatier roles, is one of the troopers. Not much seen these days, this is worth watching; it would make a good double feature with Valdez Is Coming. McIntosh’s Apache wife is billed as played by Aimee Eccles (see more of her as Dustin Hoffman’s young Cheyenne wife in Little Big Man), yet she has no lines and is scarcely seen even as a shadow. Something seems to be missing, perhaps. Some see a Vietnam allegory in this unsentimental western, although Aldrich didn’t seem to view it that way. The brutality of the Apaches is not downplayed, nor the occasional similar impulse of the white troopers. The UK DVD release has been re-edited to remove all instances of horses being trip-wired. According to the British Board of Film Classification, such a tactic contravenes the 1937 Cinematograph Act which forbids the ill-treatment of any animal in the making of a film (although some stuntmen claim that the method can be performed without harming any horses). This was decently directed by the experienced Robert Aldrich (Vera Cruz, The Last Sunset), who was said not to be entirely happy with the results. Apparently there is no definitive cut in existence, but five or six different versions on video/DVD; a wide-screen definitive restoration would be welcome. It has a good script by Scottish screenwriter Alan Sharp. In color, shot in Arizona (near Nogales) and Nevada. Rated R, presumably because of violence and brutality, but today it would likely be PG-13. Emanuel Levy in 2008 called the film “one of the best Westerns of the 1970s, … also one of the most underestimated pictures of vet director Robert Aldrich, better known for his sci-fi and horror flicks, such as Kiss Me Deadly and What Ever Happened to Baby Jane.” It was not a success at the box office, however. 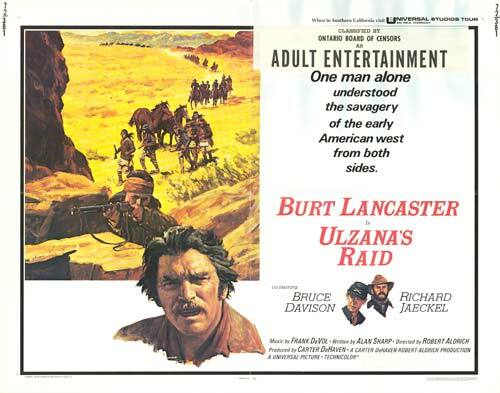 This entry was posted in Westerns Worth Watching and tagged Burt Lancaster, Cavalry Westerns, Native Americans (Indians) on October 29, 2013 by Nicholas Chennault. This excellent but slow-moving film may be the best pure end-of-an era western ever made. The emotional focus is so much on various cowboys, especially the title character and his best friend Chet Rollins, trying to come to terms with the fact that the cowboy way of life is disappearing. 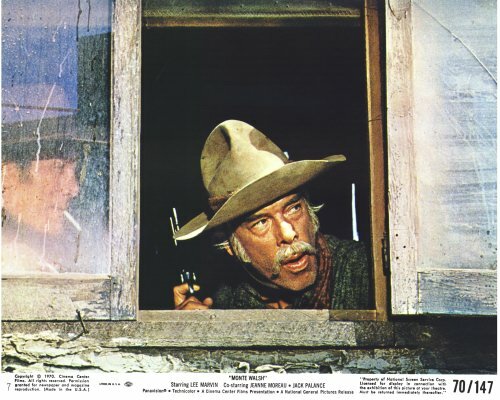 In the initial scene, Walsh (Lee Marvin) and Rollins (Jack Palance) are finishing up their winter spent at a line shack. On their way in to the town of Harmony, Arizona, they spy a wolf and are about to shoot it for the rancher’s bounty when Walsh launches into a long tale of Big Joe Abernathy, who used to wrestle wolves. After a few minutes of this, Rollins loses patience, grabs the gun from Walsh and shoots the wolf himself. Upon arrival in town, they find that the harsh winter (maybe the winter of 1888-89?) has finished off most of the ranches in the area, including the one they work for. A company known only as “Consolidated” and referred to by the cowboys as “accountants,” has acquired several of the now-defunct ranches and is experimenting with having Cal Brennan, former owner of one spread, manage their ranch holdings. He hires Walsh and Rollins for the new ranch, the Slash Y. At the Slash Y, we meet the remaining cowboys, getting to know them, getting a feel for their competence at this life, and seeing how each of them deals with the approaching end of their way of life. The most notable of them is Shorty Austin (Mitchell Ryan), the designated bronc tamer who also fancies himself a good hand with a gun—another skill with diminishing usefulness. 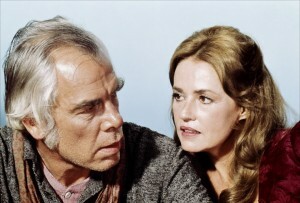 Walsh has a long-term relationship with a local prostitute, Martine Bernard (Jeanne Moreau), who lives in a one-room cabin. We know their relationship is serious because, in addition to the time taken to show their mutual regard and affection in the limited time they spend together, Walsh never pays her for that time. Chet is also developing a relationship with Mary Eagle (Allyn Ann McLerie), a widow who owns the local hardware store. Three of the Slash Y cowboys are let go, and they turn to robbing banks when no cowboy work is available. Most of the horses are sold, and Shorty is also let go. Rollins decides to marry Mary Eagle and take up the hardware trade. As Chet puts it, “Nobody gets to be a cowboy forever.” Mulling over his dubious future after the wedding, Walsh finds Martine working as a waitress in a bar/restaurant forty miles away. They make a tentative arrangement to marry, but leave the date indefinite. Martine has a cough, but says it is nothing. Meanwhile, the three former Slash Y cowboys are in a bar in Harmony during a rainstorm. A stranger in a yellow slicker gets the drop on one of them, and Shorty, also at the bar, shoots him. Peeling off the slicker, they find a marshal’s badge on the stranger, and Shorty goes on the run. In due course the outlaws find themselves in Rollins’ hardware store, and the more impetuous of them decides to rob it. When Rollins tries to talk Shorty out of the outlaw life, Shorty lets him have it with a shotgun. Walsh can’t bring himself to attend the funeral, because then he’d have to acknowledge that Rollins is really dead. Consolidated is shutting down the ranching operations at the Slash Y. Walsh takes out after Shorty. At one stop he hears that Martine is dying (like his way of life, and Chet, and the Slash Y), and he seeks her out. He’s too late; she’s already dead by the time he arrives. As he sits by her side, Shorty also arrives in town. In an extended and unromantic shootout in an abattoir, Walsh is shot but he gets Shorty, too. 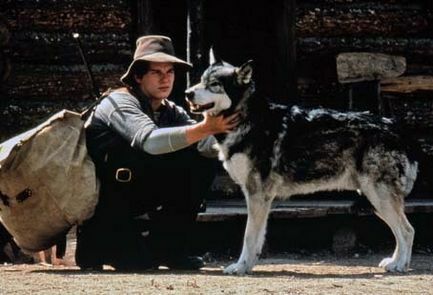 The final scene mirrors the movie’s first: Walsh is on the trail and, on sighting a wolf, dismounts and takes out his rifle. While he sights to shoot, he starts telling his horse the story of Big Joe Abernathy who used to wrestle wolves. In the end, he can’t shoot. The wolf is too much like him—an old-timer with an obsolete occupation whose future is limited. As he rides away he continues telling his horse the interminable story of Big Joe. The pacing of the film is elegiac. The signature line, spoken from Palance to Marvin: “Nobody gets to be a cowboy forever.” The leads, Marvin (especially) and Palance, are superb; there’s good chemistry and balance between them. They have a natural gravitas and substance that makes their troubles seem real and their characters substantial. Marvin’s hat has almost as much character as he does. Jeanne Moreau, in one of her rare U.S.-made movies, is quietly appealing as Martine, the doomed prostitute, although she is much younger than Marvin. Other elements of the film are excellent as well. It’s based on a novel by Jack Schaefer, who also wrote the story for Shane. The film is beautifully shot, befitting a movie directed by a well-known cinematographer who only directed four films (William A. Fraker). The score by John Barry is also very good, even the ironic theme song “The Good Times Are Comin’,” sung well by Cass Elliott. It was hard to see this film for a long time because, strangely, it was not available on DVD until Nov. 2010. In 2003, Australian Simon Wincer (Lonesome Dove, Quigley Down Under) directed a made-for-television remake with Tom Selleck in the title role. It’s pretty good, but the original is better. For another excellent movie made two years earlier with similar themes, see Will Penny with Charlton Heston. 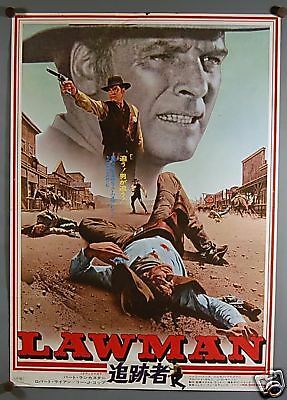 This entry was posted in Westerns Worth Watching and tagged End of an Era, Lee Marvin on October 28, 2013 by Nicholas Chennault. This is an end-of-the-cowboy era western, like (and released two years earlier than) the excellent Monte Walsh. It features great performances by Charlton Heston and Joan Hackett, as well as by supporting actors. Bruce Dern is another loathsome villain in this film, but Donald Pleasance as his deranged preacher-rawhider-father holds the screen even better. Director Gries also wrote the screenplay, and his son Jon played the boy. 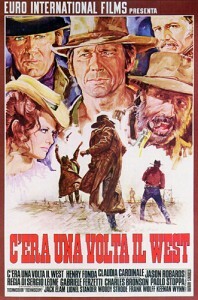 This was apparently based on an episode (“Line Camp”) of Sam Peckinpah’s short-lived television series The Westerner, also written and directed by Tom Gries. Cinematography is by Lucien Ballard, a favorite of Peckinpah. 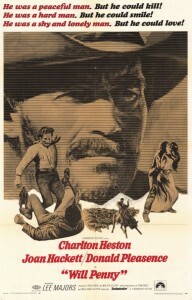 Charlton Heston in the title role. Will Penny is an aging illiterate cowboy, almost 50 years old. As a trail drive from Texas finishes, he looks for and finds a job as a line rider on the large Flatiron Ranch for the winter. At his distant line cabin he encounters Catherine Allen, a woman with a son (Horace, played by Jon Gries) heading for Oregon, now abandoned by their guide in a remote location. In their isolation Penny and Catherine encounter a bunch of “rawhiders,” a loathsome family led by a deranged preacher-father (Preacher Quint, played by Donald Pleasance), who provide much of the conflict. In the end, Penny has a choice to make now that he’s developed a relationship with Catherine. Heartbreakingly, however, he can’t take the offered family and love because he feels he’s too old; he doesn’t think he has enough time left to provide and build for them. Ironically, the actor (Heston) playing the much older cowboy survived the young actress playing the romantic interest by 25 years. This is a very good western that doesn’t take easy ways out. Heston considered the film a personal favorite in his body of work. It depends on his performance, and he was right to be proud of it. This is one of two excellent performances by Joan Hackett in westerns, before she drifted into television work and a premature death at 53. The other is the satire Support Your Local Sheriff. This entry was posted in Westerns Worth Watching and tagged Charlton Heston, End of an Era, Lucien Ballard on October 26, 2013 by Nicholas Chennault. 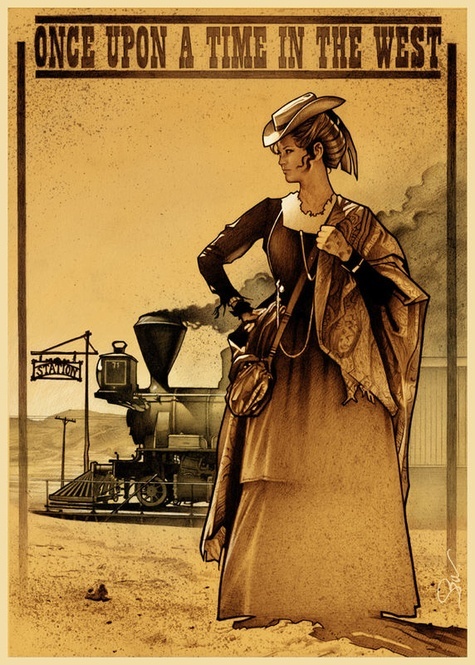 A grim variation on Stagecoach, in which a number of strangers are thrown together on a stagecoach, and social prejudices and real personalities are revealed as the stage is under attack. In this case, based on a novel by Elmore Leonard, the attack comes from bandits instead of Indians. The credit sequence is excellent, with old photographs (apparent or real) of the desert west and Apaches accompanied by music (by David Rose) which is not overtly “western.” The hombre of the title is a man who looks like an Indian (long hair, Apache headband) but is obviously a white man. 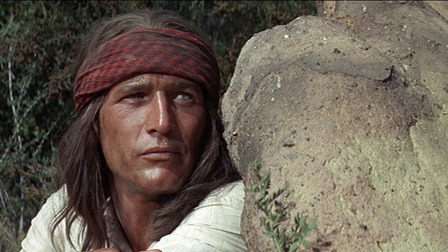 He is John Russell (Paul Newman), abducted by Apaches as a child and raised by them. When eventually rescued and adopted by a white man, he went back to the Apaches and served among the police on the San Carlos reservation. As he meets with station manager Henry Mendez (Martin Balsam in dark makeup) in a cantina, two Apaches who came with him are taunted by crass cowboys, and Russell takes decisive and quick action so we see his capabilities early. His white foster father has died and left him a boarding house run by Jessie (Diane Cilento), a widow of a certain age and experience who is capable at the business and is sharing a bed with the local sheriff, Frank Braden (Cameron Mitchell). Russell, who has cut his hair and now looks completely white, checks out the house but decides to sell it. Jessie is therefore out of a job and pushes Braden to marry her. He, however, feels at a dead end himself at 40 and refuses. The local stage line is shutting down, but a wealthy woman and her much older husband, Audra and Dr. Alex Favor (Barbara Rush and Fredric March in one of his last roles), buy a wagon and hire Mendez to drive it to Bisbee with whoever else wants to go. That includes Russell, Jessie, an ex-soldier, young Billy Lee Blake (Peter Lazer) and his discontented new wife Doris (Margaret Blye). A rough Cicero Grimes (Richard Boone, in his bad guy mode) intimidates the unarmed soldier into giving him his place in the stage. The question is developing: What do people owe each other? Russell is alienated from white people and takes no responsibility or action for others, even though he’s obviously the most competent. What will it take for him to act, as he did early in the movie for his Indian friends? As the stage makes its way on a little-used road past a mine, the cultured Favors object to sharing the stage with the ex-Indian Russell, and he moves to the top with Mendez rather than force the issue. At a mountain pass, the stage is stopped by bandits who rob it. They are looking in particular for $12,000 that Dr. Favor has stolen from the San Carlos agency, where he was the Indian agent. The outlaws include former sheriff Braden, obviously branching out into a new career. Jessie: “Frank, what are you doin’?” Braden: “Goin’ bad, honey.” Grimes is in fact the outlaws’ leader. Grimes forces Audra Favor to go with them; as it becomes obvious her husband will take no action, she accedes with a certain brittle grace. 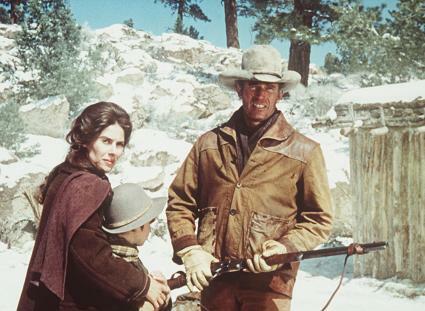 Grimes, Audra and a Mexican pistolero (Frank Silvera) move off down the trail as Braden and Lamar Dean (David Canary) puncture one of the passengers’ two water bags. Russell finds his bedroll atop the stage, pulls out his rifle and quickly kills Lamar and Braden and takes off up the mountain with Favor’s stolen money. The rest of the passengers follow. His problem is that although he is the only one in the passenger group competent with guns and violence, all of Grimes’ band are. Russell sets up an ambush with Mendez, which results in the pistolero getting shot in the gut. 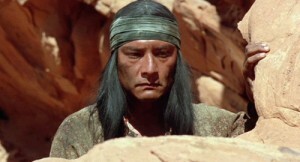 As the group makes its way on foot back to an abandoned mine, Favor repeatedly shows himself to be unreliable and Russell expels him in the desert. Nevertheless, they all make it to the mine. So do Grimes and the pistolero, who seems in surprisingly good shape for one who is gut shot. Jessie gives their presence away while trying to help Dr. Favor. When Grimes comes to parley, Russell shoots him twice. The Mexican ties Audra Favor out in the sun, where she won’t survive long. The passengers debate who should help her, although Russell makes it clear that if anyone takes down the money, Grimes and the Mexican will kill both Audra and her rescuer. The debate that has been building through the movie about what people owe each other comes to a head as Jessie seems to be the only one with enough courage to try to help. Unexpectedly, Russell takes on that role, leaving his rifle with Billy Lee to take out the Mexican as he comes out and tries to kill Russell. He walks down the hill, releases Audra (who starts slowly up the hill) and tosses the saddlebags to Grimes. Grimes finds the bags are stuffed with clothes. Russell shoots Grimes and the Mexican but is shot twice himself. Billy Lee was unable to shoot because Audra was in his line of fire. In the end, the only Christian in the group was the one who was not Christian. And he was the only one of the passengers to die. His dead face in the last shot morphs into the blurry face of an Indian child in one of the old photographs. (The photograph is said to be by C.S. 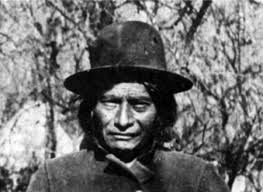 Fly of Jimmy “Santiago” McKinn, captured by Geronimo’s Apaches in 1885 and assimilated into the tribe before Geronimo’s surrender to Crook in 1886.) There does seem to have been a third bandit at the mine who is never accounted for. 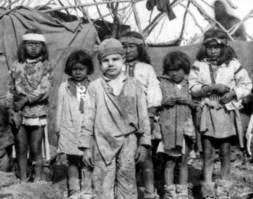 1885: Eleven-year-old Jimmy “Santiago” McKinn with Apaches upon his recapture. Blue-eyed Paul Newman is excellent as Russell. He mostly is impassive, as he is supposed to be. The way he stands, especially the way he holds his rifle, seem Indian. The tiny red feather attached to his hat band is a nice touch. Diane Cilento as Jessie is also excellent, with some of the best lines in a literate, sometimes philosophical, screenplay by Irving Ravetch and Harriet Frank. Married to each other; the pair often worked with director Ritt and also wrote Hud, The Cowboys, The Spikes Gang and Murphy’s Romance and the story for Ten Wanted Men. One wonders if Russell and Jessie will somehow end up together. Fredric March at 70 is smooth and slimy as Favor; he gives Favor more layers and much more interest than the corrupt banker in Stagecoach has. Barbara Rush is very good as his wife Audra, dealing with her cushy life falling apart. Richard Boone is superb as the villain Cicero Grimes, although he’s mostly deadly and threatening and not as silky as he sometimes could be. This is often talky for a western, but not too talky (better, for example, than some of Richard Brooks’ work in this respect). Ultimately, though, Russell is too impenetrable a character and makes a not-entirely-satisfactory Christ figure (one who voluntarily dies for the sins of others). While he’s the character we most identify with, and the movie sets up the question of how he will deal with the situation, the answer turns out to be that he can’t. And that’s ultimately a disappointment. We don’t really know why he does what he does at the end. In some ways we could deal with that if he survived and was still working things out, but it’s harder if he doesn’t survive and we still don’t quite see the whole picture. It’s slow developing and the end is not entirely satisfying. Not that Russell had to beat the bad guys; he did, after all, in a way. We just need to see a bit more of why to make the end worthwhile. The end as shown is very downbeat. Paul Newman, then at the peak of his career, would end up dead in his next western, too: Butch Cassidy and the Sundance Kid. This just misses being on the list of great westerns, but it’s very worth watching. Director Ritt was not particularly known for westerns; more for his work with Newman. This was the last of six films Ritt and Newman made together. Ritt directed modern westerns Hud and Murphy’s Romance, though. The Ravetch-Frank writing team produced a marvelous screenplay, with many memorable lines. Russell to Grimes, after Grimes has delivered his ultimatum at the mine while Russell stands silently behind Mendez: “Hey, I got a question. How are you goin’ to get back down that hill?” The cinematographer was the legendary James Wong Howe. Shot in color in several locations in Arizona, including Coronado National Forest, the Helvetia mine in Pima County, and Old Tucson. This entry was posted in Westerns Worth Watching and tagged Elmore Leonard, Paul Newman on October 25, 2013 by Nicholas Chennault. Leone takes his leisurely time getting into the movie. The lengthy introductory sequence and credits aren’t done until almost half an hour into the film. It’s interesting to watch as an exercise in filmmaking, and it’s very atmospheric, with little dialogue. Some think that this spaghetti western may be Leone’s masterpiece and one of the ten greatest westerns ever. Leone had a bigger budget to work with than with any of his Clint Eastwood trilogy. Visually, it’s probably his best. There’s a shot where Harmonica (Charles Bronson as an Eastwood-esque mysterious stranger) looks out a doorway at people building the new town of Sweetwater, and the scene is beautifully composed. 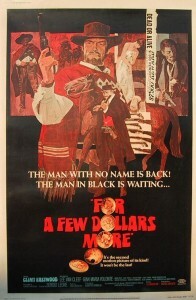 It has a very good cast, with the exception of Cardinale, whose voice is dubbed to get rid of her accent. Frank (Henry Fonda, in a rare bad-guy role) is a killer-for-hire, now working for a ruthless crippled railroad baron (Gabriele Ferzetti). He disposes of Brett McBain, owner of a ranch with water that could delay the railroad, not realizing that McBain’s new wife Jill (Cardinale), a New Orleans prostitute, is about to arrive and will have to be dealt with as well. Harmonica and Cheyenne (Jason Robards) are more or less good guys—Harmonica of mysterious origins and Cheyenne as a local bandit chieftain falsely blamed for the McBain killings. Obviously all this will get sorted out, but it will take its time. Henry Fonda as Frank the killer, in dark makeup to emphasize blue eyes. 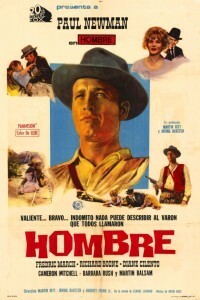 Even if it’s very well done, this movie still has many of the weaknesses of its subgenre: Less emphasis on storytelling, more on insistent reaching for emotional reactions through visual images and close-ups; over-the-top violence, although not nearly as bad as in The Wild Bunch, which was in production at the same time; lingering close-ups on faces (frequently from below) and eyes. It’s a self-conscious epic, slow-moving and seemingly in love with the process of conceiving and making the movie rather than with the story it’s telling. That deprives it of narrative thrust, but may make it more attractive to auteurs. The dialogue is extremely sparse, even though the movie is 164 minutes long. Henry Fonda’s eyes seem abnormally blue, because he’s wearing lots of dark facial makeup; so is Charles Bronson. The gorgeous cinematography makes some of the best use of Monument Valley since John Ford. Some of the movie was filmed in Spain. A buggy ride taken by Cardinale and Paolo Stoppa starts in Spain and ends up in Monument Valley in the U.S. The music is by Ennio Morricone, including some nice symphonic stretches but notable mostly for effective use of the harmonica, identified with Bronson’s character. Bernardo Bertolucci (director of Last Tango in Paris in the early 1970s) was one of the writers, along with Dario Argento, who became a one-man Italian horror film industry. The voices are a bit of a problem, too, for a big-budget film. The Italian mode of filmmaking involved shooting film without recording any sound, leaving all sound and dialogue to be dubbed in later. That means there’s usually some form of disconnect with the film, especially when, as with Claudia Cardinale, the sound you hear when she speaks isn’t her own voice. In the lengthy opening sequence, with the creaking sound of the windmill and Jack Elam’s killer trying fitfully to get a fly off his face without using his hands, Elam has only a few words of dialogue, but it’s jarring that they’re not in his voice. (His mismatched eyes and rough features have never been so lovingly captured on film, though.) Bronson, Robards and Fonda, at least, are recognizable by their voices, but sometimes the modulation and ambient sound seem wrong. That’s true with the harmonica theme, too, when Bronson’s supposed to be playing it and the acoustics are wrong. Harmonica (Charles Bronson) gets the drop on Frank (Henry Fonda). Leone and his collaborators reportedly immersed themselves in watching the great westerns before making this, and there are lots of references from these films. 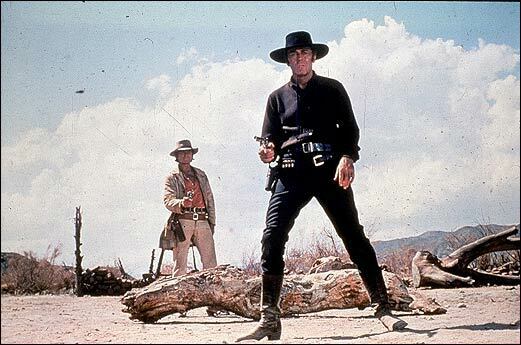 Both Clint Eastwood and James Coburn are said to have turned down the role of Harmonica. Robert Ryan was to have played the sheriff (actually played by Keenan Wynn), but had to back out when his role in The Wild Bunch got larger. John Landis is a stunt double. This was Leone’s last western, unless you count Duck, You Sucker, a story set during the Mexican revolution for which Leone served as producer and perhaps director. 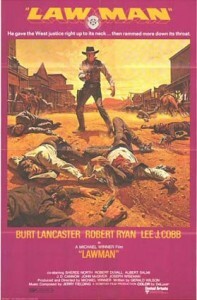 Debate as you may whether this is one of the ten best, or even one of the 55 greatest westerns. What cannot be debated is that to have any kind of informed opinion you have to see this and Leone’s Man with No Name Trilogy. 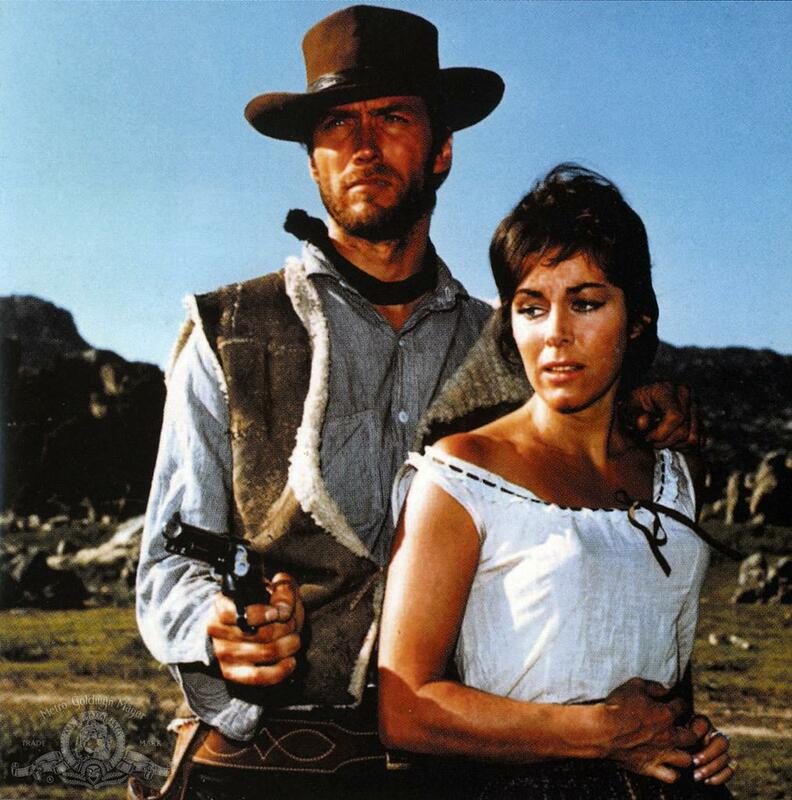 They represent the very best of spaghetti westerns and a new approach that has influenced western movies ever since. This entry was posted in Westerns Worth Watching and tagged Henry Fonda, Jason Robards, Sergio Leone, Spaghetti Westerns, Trains on October 24, 2013 by Nicholas Chennault. There are different versions of this floating around. The one I saw most recently said it was the “extended English language version,” about three hours long. 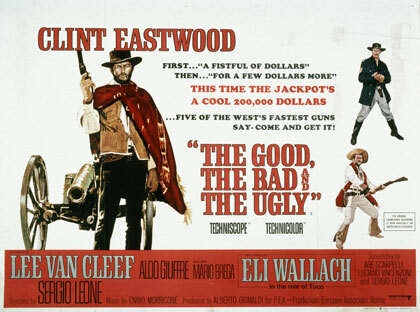 That leaves Sergio Leone to take half an hour introducing the three principal characters, which he does in reverse order: the ugly (Wallach’s Tuco), the bad (Van Cleef’s Sentenza-Angel Eyes) and then the good (Eastwood’s Blondie). In particular, the sequence introducing Tuco is very reminiscent of the early part of Once Upon a Time in the West, with anonymous gunmen waiting without dialogue on a dusty and wind-swept western street and the camera frequently cutting to 2/3-face closeups. The production values are higher than the first two in Leone’s “Dollar” or “Man With No Name” trilogy, and he clearly has a larger budget and more time to spend with his directorial tropes and mannerisms. 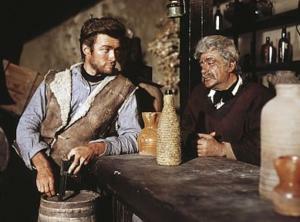 As in other Leone films, the dubbing is sometimes a distraction to American viewers. Aside from the three leads, the cast was almost entirely composed of non-English speakers. After the introductions, it is clear that Tuco and Blondie are running a scam by which Blondie turns in Tuco for the reward on his head (either $2000 or $3000). 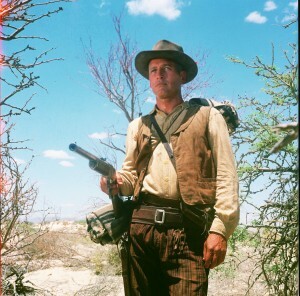 As Tuco is being hung on horseback, Blondie springs him by severing the rope with a well-placed bullet and making the authorities duck for cover. They move on to another town and repeat the scam. (There’s no suggestion about what would happen if the hanging were from a gallows, rather than from horseback.) Tuco wants a larger share than half, and he and Blondie take turns betraying each other. Meanwhile, Angel Eyes is in pursuit of $200,000 in gold. Tuco and Blondie get wind of the same pot of gold from a dying Confederate soldier who tells Tuco the general location and Blondie the specific spot, so they then need each other to find the gold. Disguised as Confederates, Tuco and Blondie are captured by Union soldiers and taken to a prison camp, where the sadistic sergeant turns out to be Angel Eyes. Ultimately the three end up at a cemetery where the loot is buried and have a three-way shootout, in which Angel Eyes is killed by Blondie and Tuco finds out he has no ammunition in his gun. Not much time was spent trying to come up with a story that would hang together well; it’s all about atmosphere, mood and composition. Theoretically it takes place in the west during the Civil War. There are references to Glorieta, and that presumably means New Mexico, where the only Civil War battle in the west took place at Glorieta Pass. It wasn’t as big a clash as depicted in this movie. There are also troops using trains, and there were no trains in New Mexico until about a decade after the war. 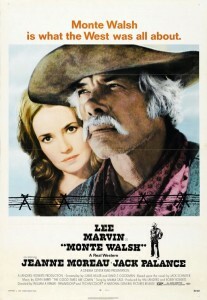 Some say this is Leone’s masterpiece; others would claim that honor for Once Upon a Time in the West. Still others would say that For a Few Dollars More is a better movie than either. This is brilliantly directed and beautifully filmed but short on story and cohesiveness considering its length. 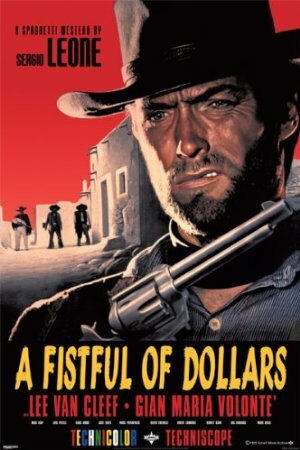 The Eastwood and Van Cleef characters look just the same as they did in For a Few Dollars More, but there’s really no continuity with them from movie to movie. Each film stands alone. At the end of the movie, Eastwood is wearing the same sheepskin vest and serape that he wore in the other two movies. In terms of time, this should be the last, but it’s probably the earliest, taking place during the Civil War. In particular, Van Cleef turned out to be a sort of a good guy in For a Few Dollars More; here, he’s the Bad, and he has little of the gentlemanly quality from the prior movie. The two movies made him a star of sorts, though, and he had a lucrative career in spaghetti westerns at this late stage. The music by Ennio Morricone is brilliant, but during the movie it’s kind of intrusive and loud. The theme is perhaps the most familiar of any of the music from the Leone-Morricone collaboration over the years. The direction by Sergio Leone was influential, particularly for Eastwood. 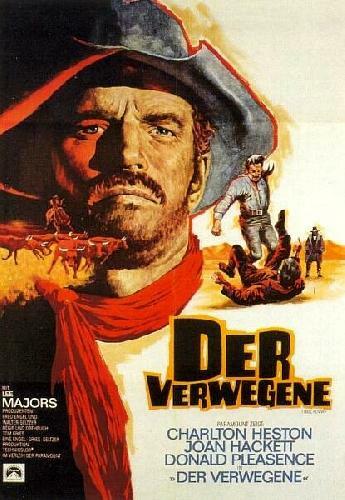 Although it’s better done (and has better production values) than most spaghetti westerns, it still has the subgenre’s weaknesses: the interminable tight close-ups where nothing seems to be happening except sweating, the long shots of desolate landscape and a very small rider or person, the taste for the over-the-top violent and the surreal, the wildly improbable marksmanship. Eastwood’s character is seldom without a slender cigar in his teeth, but those teeth are very white for a constant smoker. 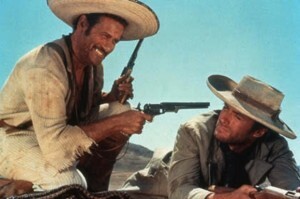 Between playing Tuco Ramirez in this movie and Calvera in The Magnificent Seven, Eli Wallach made himself the quintessential cinematic Mexican bandit chieftain, but there’s a fair amount of the stereotype in his portrayal, too, emphasized by the frequent lingering close-ups and lots of braying laughter. There are lots of shots of drawn-out slow movement around almost abstract landscapes. 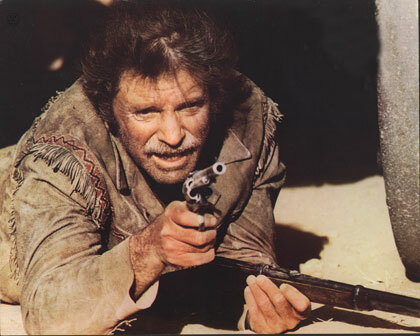 There is also a brilliantly edited shot where Tuco is about to shoot Eastwood. who has a noose around his neck; cut to cannon shooting, cut back to destroyed building where Tuco has fallen through a floor or two and the now empty noose where Eastwood was. Filmed in Spain. This entry was posted in Westerns Worth Watching and tagged Civil War, Clint Eastwood, Lee Van Cleef, Sergio Leone, Spaghetti Westerns on October 23, 2013 by Nicholas Chennault. 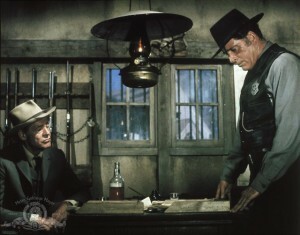 The opening scene is characteristic Leone, although others have used variations (Budd Boetticher at medium distance in Ride Lonesome, for example). A distant horseman rides toward the camera, while there are sounds indicating that the camera stands in for the eyes of a second person. After the credits (innovative for 1965), the still-distant rider is blasted out of the saddle, and it is clear that he was shot by the person through whose eyes we watched him approach. 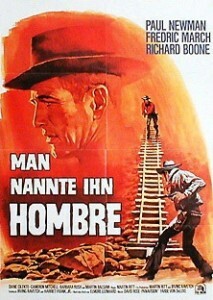 The Man With No Name might not survive the early part of the movie. 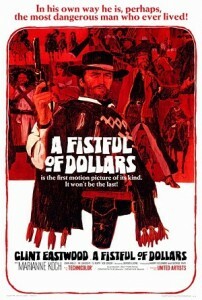 This is the second in Leone’s Dollars Trilogy, not really a trilogy except in a general way. There’s no continuity of story or character from movie to movie. Clint Eastwood looks the same as he did in the first, complete with the same serape (which was rumored never to have been washed through the filming of the three movies). This is the movie that made a spaghetti western star of Lee Van Cleef, who’d been playing western bad guys at least since High Noon in 1952. He looks meaningfully dangerous as Col. Douglas Mortimer in the steely-eyed closeups of which the Italian directors were so fond. 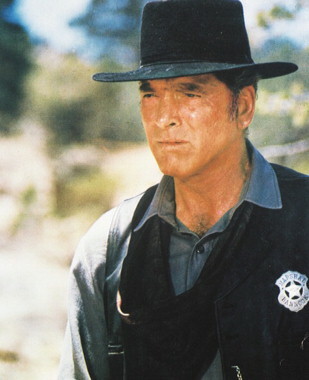 Although the Eastwood character is referred to generally by fans as the Man With No Name, he is called Monco (Manco?) once early in this film. Gian Maria Volonte also re-appears in this second film, although his character was killed in the first. He is again the villain, this time called El Indio, leader of a gang of outlaws. Col. Mortimer, unintimidated by hunchbacked gunfighters. Monco and Col. Douglas Mortimer are bounty hunters, here called “bounty killers.” We see the prowess of each separately at the start, and then they both start hunting El Indio—Monco for the reward and Mortimer ostensibly for the same reason. Actually, Mortimer has a more personal motive for hunting El Indio. When they first meet, they have an impromptu hat-shooting contest, although neither hat thereafter shows the effects of having been shot multiple times. The two join forces, but we’re never quite sure if they’re really working with or against each other. Monco gets the gang to accept him so he can see their plans and perhaps influence them. Eventually the two bounty hunters are found out and are badly beaten. El Indio is pulling a double-cross on his own men, with the two outsiders in the middle of it. They both survive the lengthy concluding shootout, and it is revealed that El Indio once killed Mortimer’s young sister and her husband. Mortimer leaves the entire reward for Monco, and they part ways amicably. Leone grows visibly as a filmmaker from one movie to the next, or maybe he just has progressively larger budgets to work with in each of his four westerns. In any event, the production values get better with each movie he makes. As always, Leone is more interested in mood and myth than in storytelling. There’s an absurdly high body count in this film, and it moves slowly, with lots of time for closeups on eyes, moody sizing-up of each other by various participants, and low camera angles. It’s long for a mid-1960s western at about two hours and fifteen minutes, and much of it feels slowly-paced. Sometimes it seems as though Leone deliberately withholds details of the story so he can surprise the viewer later. It’s not entirely honest. 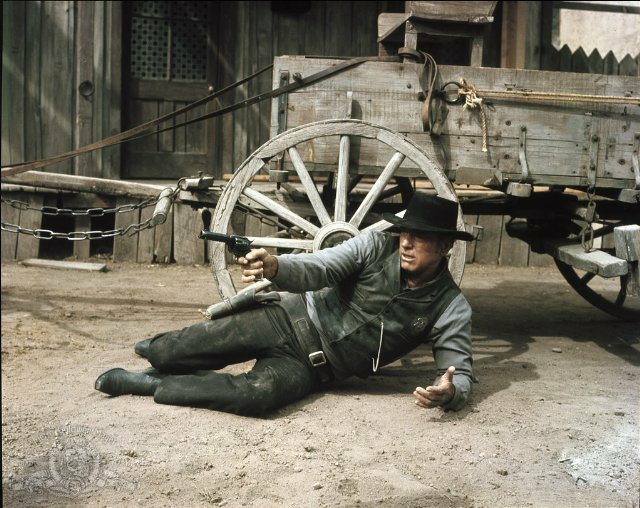 As Leone sets up the final shootout between Mortimer and El Indio within a wide circle, you can almost see that he’s dying to play with a three-way shootout in the same kind of setup; he actually does this in his next movie, The Good, the Bad and the Ugly. As with the first (and third) in the trilogy, this film has an excellent score by Ennio Morricone. Unlike the first and third in the trilogy, the music does not sound as disproportionately loud. 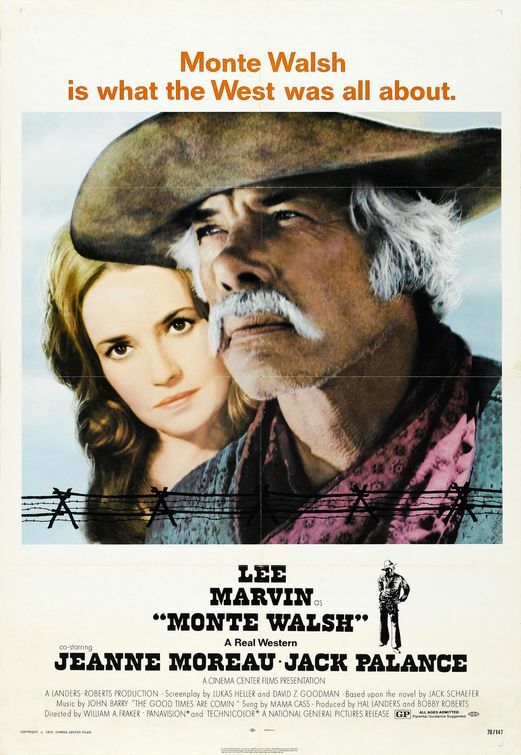 This is probably the least seen of the trilogy, but it’s still remarkably good—maybe Leone’s best western. It’s not really a sequel to the first; all three movies are independent stories without repeating characters, although several actors play similar roles in identical garb. Look for Klaus Kinski as Wild, the hunchbacked gunfighter killed by Mortimer. He made more than one spaghetti western at this stage of his career. This was filmed in 1965 in Spain but not released in the U.S. until 1967. 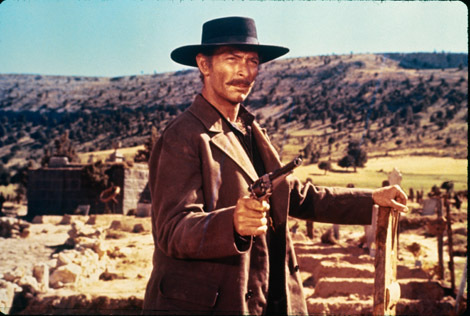 This entry was posted in Westerns Worth Watching and tagged Clint Eastwood, Lee Van Cleef, Sergio Leone, Spaghetti Westerns on October 22, 2013 by Nicholas Chennault. 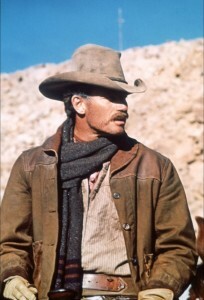 In the opening scene, an American drifter wearing a serape (Clint Eastwood as the Man with No Name, although he’s called Joe by the undertaker) rides a mule into the Mexican town of San Miguel, not far from the U.S. border with Mexico. He witnesses an incident where a small boy is chased away from Marisol (Marianne Koch), his mother. The owner of the local saloon explains that the town is dominated by two gangs, the Baxters and the Rojos. The American thinks he can make some money for himself by playing the two clans against each other, and he’s right initially. The most formidable of any of them appears to be Ramon Rojo (Gian Maria Volonte), who uses a rifle exclusively and says, “When a man with a .45 meets a man with a Winchester, the man with the pistol is a dead man.” Marisol is Ramon’s “hostage.” The Rojos are running scams on every side, killing contingents of Mexican and American soldiers and making it appear that they killed each other. Clint Eastwood with Marisol (Marianne Koch). As matters develop, the American helps Marisol escape with her son and husband, enraging Ramon. The Rojos beat him to a pulp, and he escapes their compound although he can barely move. As he lies low, he sees the Rojos gun down the Baxters, including the Baxter matriarch. He recovers while he lies in a local mine, only to find that the Rojos have taken and are torturing his friend the saloon keeper Silvanito. Talking things over with the fatalistic bartender Silvanito. The American puts on his gun and poncho, and appears before the Rojos out of the cloud of an explosion. Ramon empties his rifle into the American, who keeps getting back up and coming ahead. Finally, he reveals that he’s wearing a heavy metal plate under his poncho, deflecting all Ramon’s shots. He takes out all the Rojo men except Ramon, and puts Ramon’s dictum to the test. They both reload, and the American wins. This was filmed in 1964 in Spain, but not released in the U.S. until 1967. Although it was a remake of Akira Kurosawa’s Yojimbo (1961), it was made without Kurosawa’s permission, and Kurosawa sued Leone. He later said he made more money from the lawsuit than he did from Yojimbo. This was the film where American audiences were first exposed to (a) Clint Eastwood as a movie star, (b) a western with music by Ennio Morricone, and (c) spaghetti westerns in general and Sergio Leone in specific. All those have worked out well. 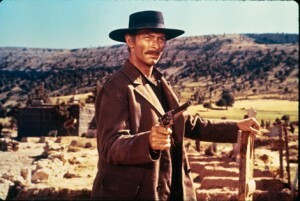 Leone uses the full width of the panoramic screen, capturing Eastwood facing off against four and five gunmen all in one shot. 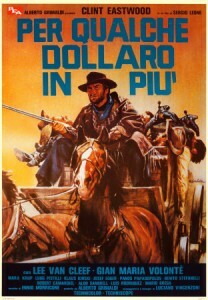 Leone and Morricone had known each other since the third grade, but this was the first time they worked together. The music seems a little loud, perhaps because it’s usually just one whistle or flute at high-ish volume. Note the four-note descending theme whenever the American makes an appearance or comes to a realization. It was made with a low budget, and it features many of the hallmarks of Leone’s later work. It became a cult classic, to be remade again by Walter Hill with Bruce Willis as Last Man Standing (1996). Even though it was made with a characteristically low budget, it looks much better than most spaghetti westerns—evidence of Leone’s expertise from the start. Ennio Morricone’s music here is unpleasantly jangly. Leone wanted a Rio Bravo-type Deguello on the trumpet and Morricone came up with some Mexican-inflected trumpet music, along with his signature whistling, simple wooden flute and chanting. The soundtracks of these three films were cheaply done and tended to avoid orchestral arrangements of original scores because of the cost that would be involved. 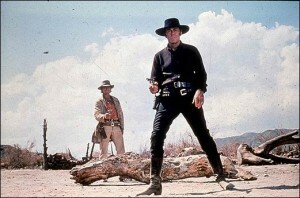 These three Leone films (the Dollar or Man With No Name Trilogy) made Clint Eastwood an international star. Prior to his work in these films, he was known principally for his work as Rowdy Yates in the television western Rawhide. This entry was posted in Westerns Worth Watching and tagged Clint Eastwood, Sergio Leone, Spaghetti Westerns on October 21, 2013 by Nicholas Chennault.